Chris Giwa, founder of a rival faction in the Nigerian Football Federation, has been banned from football-related activity worldwide by Fifa. In May 2016, Giwa and four others in his group were banned by the NFF for five years for impersonation and taking football matters to a civil court. The ban was for breaches of the NFF statutes and the Fifa code of ethics. 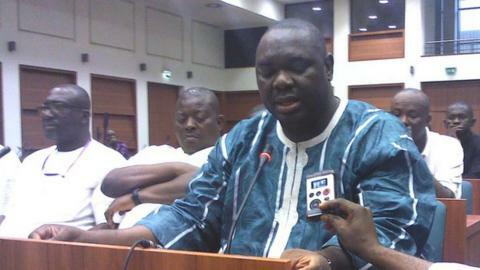 Giwa has since August 2014 insisted he was elected NFF president in a disputed vote that was not recognised by Fifa. Giwa, Muazu Suleyman, Yahaya Adama, Sani Fema and Johnson Effiong were later suspended, and Fifa said in a statement on its website on Tuesday that the bans would apply worldwide. However, Giwa intends to launch an appeal. "They [Fifa] have not communicated to us directly and reading something on Fifa's website is not a direct communication," Giwa told BBC Sport. "Once we hear from Fifa then we will take the necessary steps and we cannot rule out [filing an appeal with Court of Arbitration for Sport] over something so excessive."